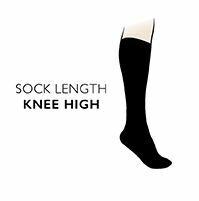 Whether you prefer to pull them all the way up, or scrunch them down for a thick layer of warmth around your ankles, these ToeSox Scrunch Half Toe Organic Cotton Knee High Socks, with their patented ToeSox sole grips, and exposed toe tips, give your feet the freedom and hold they need. The separate five-toe construction encourages independent toe movement, for stability, strength and promotion of natural flexibility. The socks are made from organic cotton rich stretch fabric for breathability and comfort, whether you are doing yoga, Pilates, barre or ballet work. Machine wash gentle cycle, line dry or low dryer heat.